This fully functional pipe tomahawk has a heart cutout in the brass axe head and a buckskin wrapped wood stem. 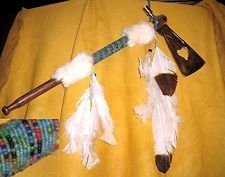 It is decorated with white rabbit fur and has beadwork done in turquoise and multicolor glass seed beads on the handle. 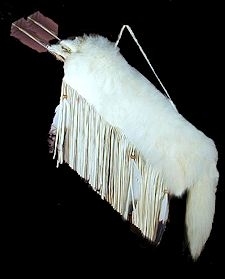 The buckskin streamers are decorated with turquoise and black glass crow trade beads, imitation eagle feathers, and white turkey fluff feathers.